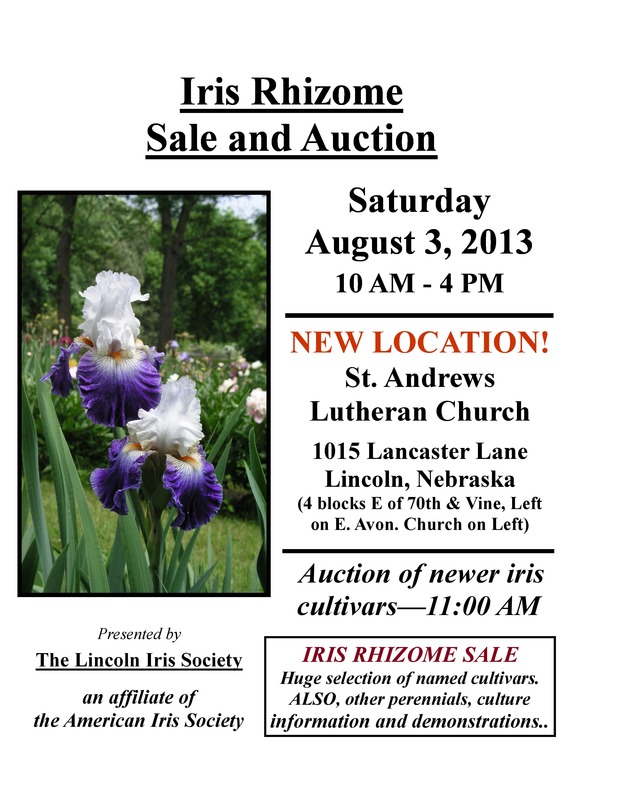 If you are in the Lincoln area this weekend, stop by the LIS annual iris rhizome sale and auction between 10AM and 4PM. The sale will be located at St. Andrews Lutheran Church at 1015 Lancaster Lane in Lincoln, Nebraska. This is a new location for the sale, second year at this site. Directions to the sale are from 70th and Vine St, then 4 blocks east on Vine, take 1st left past the school, onto E. Avon. Church is on the left. This year, there will be a very large sale of a huge selection of cultivars. 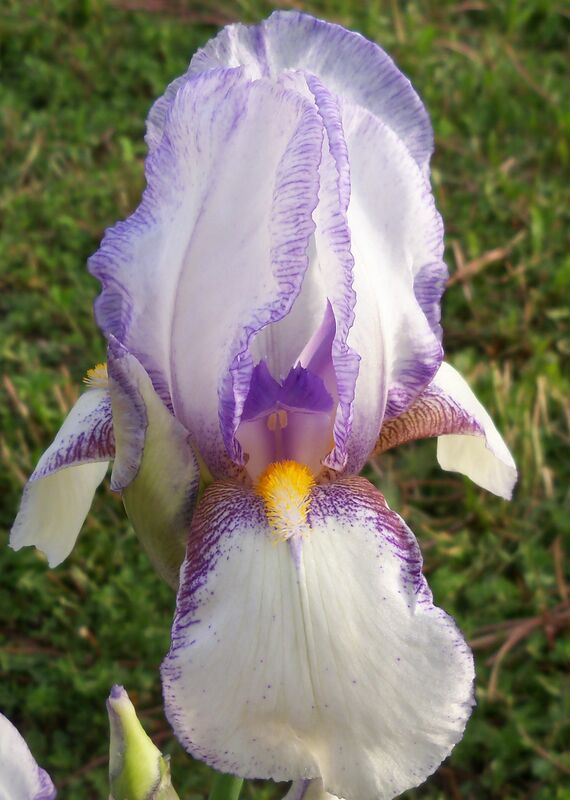 Included will be a large number of historic iris rhizomes, especially Sass irises. Lots of other newer irises will be available, including Dykes Medal winners and a number of Allan Ensminger hybridized irises. Expect to find irises from most of the bearded iris classes including Standard Dwarfs, Intermediate, Miniature Tall, Border, and Tall Bearded irises. Every year there are some interesting surprises on the sale tables and that will undoubtedly happen again this year. In addition to bearded irises, there may well be Siberian irises for sale. And, there will be a limited number of Daylilies for sale, usually cultivars that are not found at local commercial outlets. 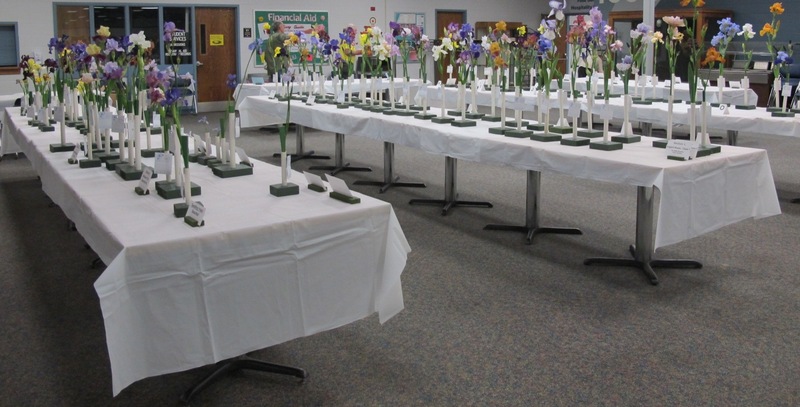 An auction of newer cultivars, primarily Tall Beardeds and mostly 2012 and 2013 introductions, will take place at 11 AM. Most of the auction irises this year come from Superstition Gardens (Rick Tasco and Roger Duncan) in California and from Mid-America Garden (Paul Black and Thomas Johnson) in Salem, Oregon, though there are a few late model introductions from other hybridizers as well. 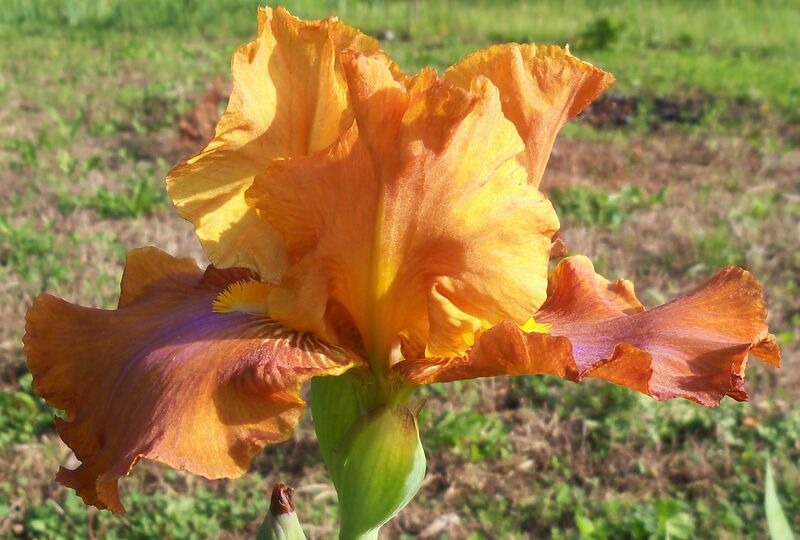 Finally, there will be demonstrations on dividing and planting bearded irises. Information about growing irises, the Lincoln Iris Society, Region 21, the American Iris Society, the Historic Iris Preservation Society and other iris Sections will also be available. For more information about the sale, contact Gary White at (402) 421-6394 or (402) 432-1550. The 2013 show was smaller than in previous years; but, every bit as interesting. This was the year for historic irises. Historics won Best of Show (Miss Aravilla), Best Bicolor (Gracchus), and Best Youth Specimen (King Midas). The season was late; but, the selection ranged from SDB’s to Siberians. There were two firsts in this show: 1st and 2nd runners-up for Best in Show were chosen by the judges and we offered a pre-sale option as part of our annual sale. The absolute best thing is that we had twenty people enter the show this year, which may be a record high! Judges for the show were Carolyn Lingenfelter and Marjorie Jansen of Norfolk, Nebraska. A big thank you to our Popularity Vote tabulators, Eunice Cernohlavek and Sally Schrader, for their expertise in handling this portion of the show! 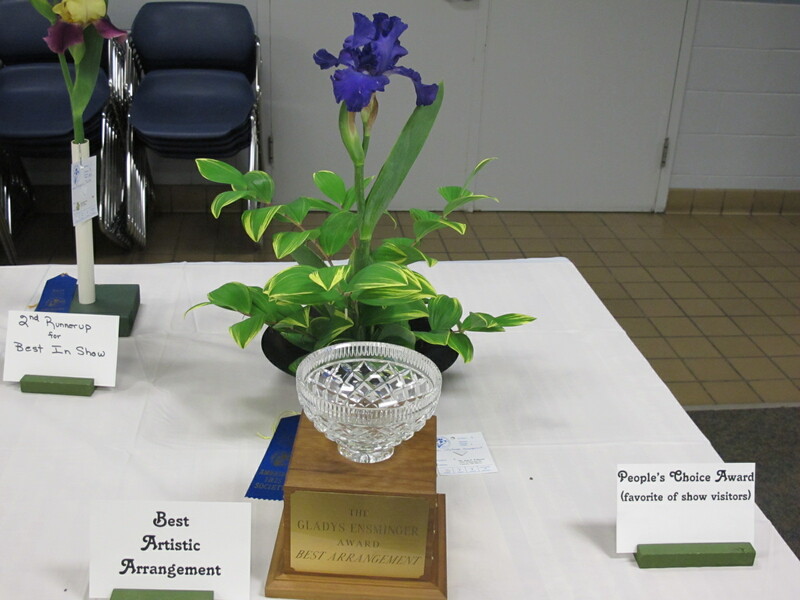 Congratulations to the Lincoln Iris Society and everyone who entered! You can see the complete list of winners LIS_ShowResults-2013 (PDF). Ballots and instructions are available on this page. Your selections need to be to our RVP by September 1st, either by email or regular mail. The Presby Memorial Iris Gardens were established in 1927 to honor Frank H. Presby, a founder of the American Iris Society. They are home to the largest public collection of irises in the United States. This year they are renovating their heirloom beds and are offering historic irises from these beds for sale. You can see (and order) the initial twelve historic irises they are offering at their shop on Etsy. Their iris varieties for sale will be updated as they continue to renovate their beds through July and August. The Region 21 Fall Conference will be hosted by the Greater Omaha Iris Society August 9th and 10th. Join us for an interesting and educational conference. Region 21 AIS members should have/should soon receive the notice and registration form. You can also download the information and registration form here (PDF). Further details below. * educational sessions meet criteria for judges training c.e. from the AIS. Conference sessions and activities will take place at Mammel Hall, located on the University of Nebraska at Omaha’s Ak-Sar-Ben Technology Campus. The first NU system building to earn gold LEED certification, the facility is a showpiece of technology and artful design. A limited number of seats for Mr. Hollingworth’s morning presentation are available to non-conference participants for $5.00 per person (10:00 AM Saturday, August 10th). 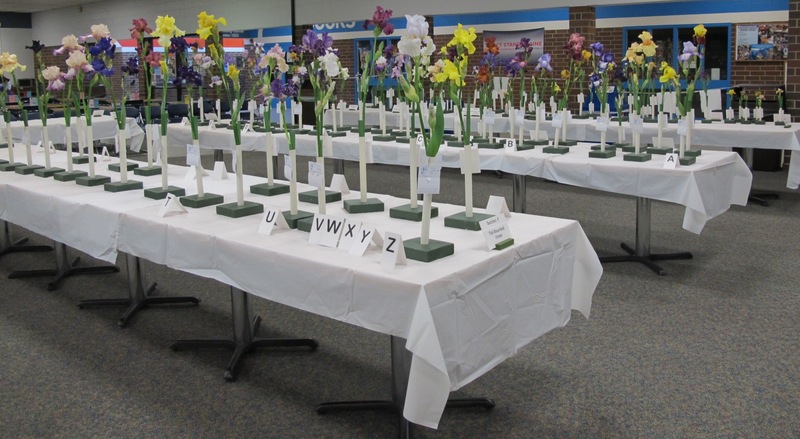 The Greater Omaha Iris Society‘s newsletter Iris Gleanings for July is now available. Among the meetings it includes are their Annual Rhizome Sale and Auction July 26 – 27 and the Fall Regional Meeting August 9 – 10. See the next posting for more on the Fall Regional Meeting. To see the newsletter, go to our Newsletter page and follow the 2013 33 Number 5 link to download or open the PDF of the newsletter.